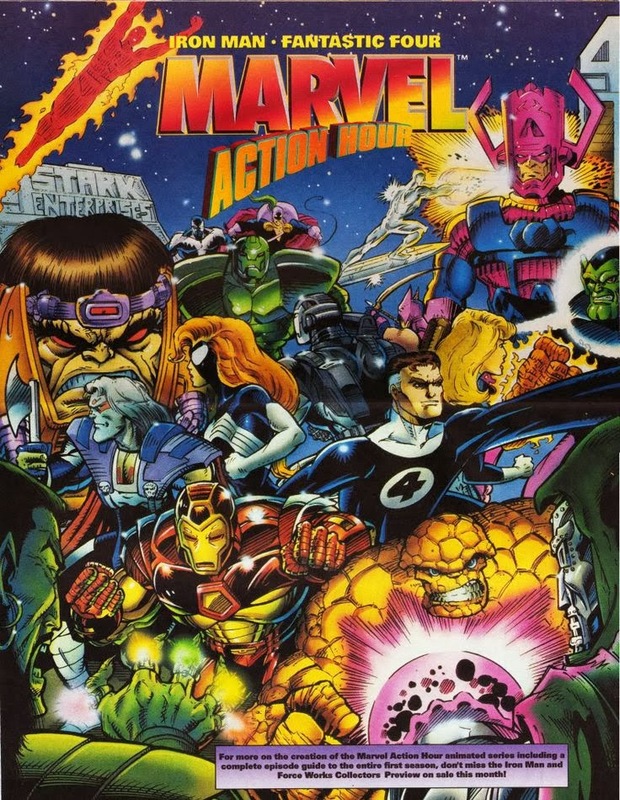 In concept it's flawless - a packaged show, hosted by Stan Lee, where the first cartoon is based around The Fantastic Four and the second half, the adventures of The Invincible Iron Man. However, despite the runaway success of Fox's X-Men and Batman: The Animated Series, the powers that be decided to initially row this boat's tories and art towards a younger audience, with results to match. Given a second shot, a revived Marvel Action Hour put on an all new suit of armour and came out ready for battle, like it should have the first time. Stan Lee's intros were shortened, hot new intro sequences were given to each feature and more mature writing and art overhauled both segments. These were the first two comics I ever subscribed too, and finally, their time had come. Iron Man now belonged to Koko Enterprises and as a result opened with the below blasting electric score, roaring behind a Tony Stark forging his new destiny in a fiery furnace. With many stories lifted from the pages of the Force Works / Avengers West Coast and Iron Man comics, solo tales were replaced by engrossing ongoing plot threads. Stark having faked his death, found himself kicked out of the team, with only Spider-Woman and War Machine remaining by his side. This allowed Stark's in-comic rivalry with Hawkeye to develop and although his redesigned armours were all killer, it was a pity the attitude of U.S. Agent never popped up, especially as M.O.D.O.K. and Ultimo surfaced. Capping off the final episodes, Mandarin had collected his scattered power rings over the season and used them to render all technology inert. Forcing Force Works to reunite, this plot was well-timed, as it paralleled the surrounding 'Iron Man family' comic crossover, Hands of The Mandarin - right down to the foe's unmasking of Tony Stark! The Fantastic Four by contrast was revamped to showcase exactly how wide-ranging the length and breadth of Marvel's launchpad title was. Philippine Animation Studio, Inc. debuted darker uniforms for the famous quartet, replacing the Baxter Building with Four Freedoms Plaza and balancing influences between comic legends John Byrne and John Buscema as well as Stan Lee and Jack Kirby. The Four's rogues gallery, unique locales and allies all got mined for gold in equal portions. This meant fans and newbies alike were treated to Wakanda, The Great Refuge, Black Panther, Malice, The Frightful Four (Wizard, Medusa, Hydro Man and Trapster), and even an Iron Man morphing Super Skrull - with Lyja Laserfist leading his army! 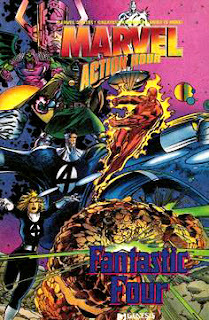 Not only did the revived Fantastic Four air classic comic plots such as Johnny dating Crystal and Frankie Raye becoming Nova, Herald of Galactus, it featured a variety of other heroes befitting a core Marvel title. Thor, Daredevil, Ghost Rider and Hulk guest starred - with Doctor Doom even jumping over to the latter's own series in return! With War Machine also dropping in on Hulk and Iron Man in Spider-Man, it really showed these revived cartoons were making the most of an uncertain future. While neither was renewed a third time, looking back, Marvel's first shared on-screen universe was right here. Did you know? A third season of Fantastic Four had made it to the planning stages and was going to tackle the Invisible Woman's pregnancy. This would allow the new crew their shot at Namor and bring both Medusa and She-Hulk in to fill Sue's slot on the team. I absolutely loved loved loved Marvel Action Hour when it first came out - the least said about the first FF season the better. We saw it here on Sky [cable] tv and it was on very early in the morning, incorrectly labelled 'Hour of Power; which was actually a religious programme - imagine our frustration at getting up at 6.30 on a Sunday morning to expect the FF and get some religious nut instead[!]. Season two however was a VAST improvement- darker costumes, better action [the FF actually did some fighting in this season, it was more action-packed all round] plus the SUPERB title sequence, well worthy of a live-action tv show, Just adored it all round. After six episodes, Sky cancelled further showings, and it was relegated to pay-per-view so that was finite for us. I did manage to get a complete episode list from somewhere and was mortified to see after the Ego ep how much Id missed[!]. Fast forward ten years and after the second FF movie came out, Sky decided to show the entire second season and I recorded it all on video [yes, video] an da year later I got the entire two season box set on DVD. Ive also got three videos of the first Marvel Action Hour featuring the FF, two eps per video. Wouldve loved to have a third season. Over on our FF forum, our major pain [a girl who loves the Thing] first got onto the FF thru this animated programme and is always dissecting his dialogue and asking ;why did Ben say this' makes one wish shd never seen it in the first place! btw I also have all 33 eps of the original Hanna Barbera FF cartoon from the late 60s and the 1978 HERBIE cartoon, both on homemade videos and DVDs. I even got the rare Ashcan black and white edition [with interior art by Paul Ryan] that came out at the same time as the animated show - two of the images are presented here in your piece, Dan. Regarding Iron Man - I couldn't get into it, as I wasn't that hot on the book at the time, and the costumes worn in the animated series weren't the same as the comic [Scarlet Witch's were particularly bad] and the inclusion of the second Spider-Woman seemed a bit random. ~They used far more computer animation in the Iron Man ones than the FF which was a real shame to me. I have fond memories of this block as well Dan. Yeah it wasn't as sophisticated as B:TAS, but it was still better than nothing. Plus it lead the way to the Incredible Hulk series, then Spider:TAS which was the best of all of the marvel cartoons with the X-Men giving it damn good competiton for first. Marvel dropped the ball big time with the Avengers and Silver Surfer cartoons, which kept a Captain America series from ever seeing the light of day. Shame, but damn were the 90's a great time to be a kid on Saturday mornings. Thanks for the comments guys! Karl, I have the ashcan that I use in the post too - and the animated slide from the cartoon it came with. I didn't get all four (it was polybagged with select IM / FF related comics), but I just got the one from Force Works. The Scarlet Witch costume came from her own mini series at the close of Avengers West Coast. I wish they'd grabbed the one designed by Joe Mad for the latter issues of Force Works, IMO that is still her best gettup. Here M.A.H ran on Sunday afternoon leading into America's Funniest Videos at 6pm. I always wondered if Stan should host that show :) The slot was were Hulk also ran. Dale - I carry all the Spider-Man episodes round on my smart phone. I'm living between cities at the moment, and often watch them on my bed. Esp any featuring Hobgoblin or Venom! I LOVED Silver Surfer but no surprises there I guess. I even know two folks who were turned onto comics just by hearing the tale of a Norrin who lost everything to soar the spaceways. All those cameos! These days, animation effects could really bring us something cosmic, so hopefully they do so again soon!